Give this man an award for Worst Manager Ever! 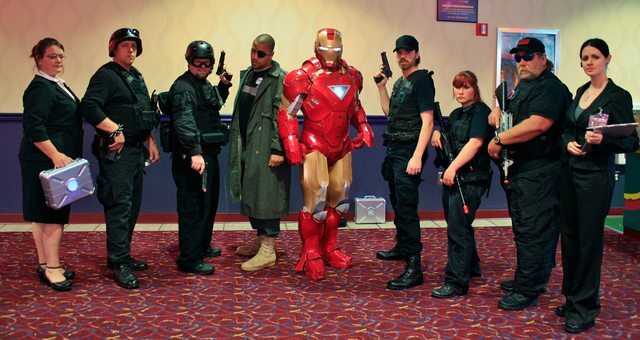 A movie theater in Missouri decided that hiring a group of people to dress in tactical gear carrying fake weapons was a great idea for a screening of Iron Man 3. Apparently the manager and staff at Capital 8 Theaters in Jefferson City, Missouri wanted to get moviegoers excited for the film by dressing up the hired actors to resemble S.H.E.I.L.D members, who are part of the Marvel world’s secret intelligence. Surprisingly the whole idea back fired, freaking people out, prompting them to call the police for fear that this was a repeat of the Aurora, Colorado shooting incident that took place at the screening of Dark Knight Rises. "We apologize and are sympathetic to those who felt they were in harm’s way with our character promotion for Iron Man 3. This was not a publicity stunt. We have worked with the Cosplacon group on many movies to dress up and help entertain our customers. We have had many complaints about the members dressed specifically as S.H.I.E.L.D. operatives carrying fake guns. We didn’t clearly tell our customers and some people didn’t realize it was for entertainment purposes only. We apologize that police were called to come out to our theater. We have a wonderful working relationship with the Jefferson City Police Department. Going forward we will take the necessary steps to make sure this doesn’t happen again. Security and safety for our customers is our number one priority."